JIM SALICRUP’s Favorite AVENGERS Story! Home » COMICS HISTORY » JIM SALICRUP’s Favorite AVENGERS Story! It’s AVENGERS WEEK! We’ve asked some of the top names in comics to pick their favorite stories. Here’s former Marvel editor Jim Salicrup — now editor at Papercutz! For Kevin Nowlan’s pick, click here. For Joshua Hale Fialkov’s pick, click here. For Mike Allred‘s pick, click here. For Ron Marz‘s pick, click here. For Fred Hembeck‘s pick, click here. The Avengers #57. 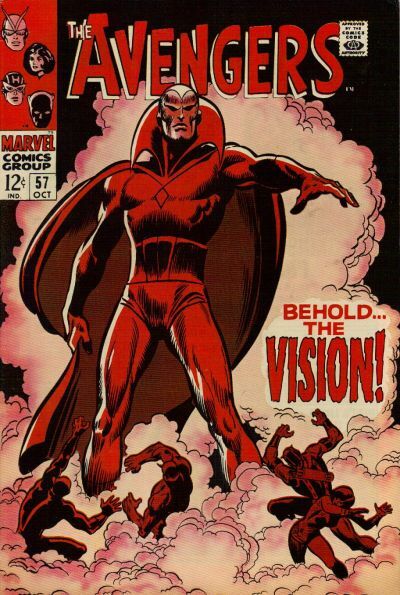 “Behold… the Vision!” Roy Thomas, writer; John Buscema, penciler; George Klein, inker; Sam Rosen, letterer; Stan Lee, editor. Roy and John were firing on all cylinders, and like the classic Lee/Kirby Fantastic Four issues that introduced major new characters into the Marvel Universe (such as the Silver Surfer, the Inhumans, etc. ), this issue introduced one of my favorite characters — who was always identified as one of the Avengers — the Vision. This was, and will always be, the definitive version of that character for me. And, boy, he sure knew how to make an entrance!